The Fibonacci roulette system is less aggressive when compared to the Martingale system, as there is far less of an increase on the amount you are wagering from one bet to another. Therefore on a series of losing spins, it will take longer to recoup your losses, unlike in the Martingale system which only requires one bet, and returns a little extra on top. This particular system makes use of the Fibonacci sequence, which is 1, 1, 2, 3, 5, 8, 13, 21, 34, 55, 89 and so on. The sequence is created by adding the previous two numbers in the sequence, starting from the number 1. This is a naturally occurring sequence in nature, and was actually initially created to work out how fast rabbits could breed. Not quite sure how it made the transition over into betting strategies, but I'm sure the rabbits won't be too bothered. When the Fibonacci sequence is used in roulette betting, you follow along the sequence to determine how much you wager on an even money bet. If you lose your bet, you continue along the sequence from 1 unit, to 1 unit again, then 2 units – 3 units – 5 units - 8 units and so on, writing down the sequence as you go along. The trickier part with this system comes in when you win a bet (funnily enough). If your bet wins on the first go, you simply start the sequence over again. However, if you are further along the sequence after a number of back to back losses, you simply cross off the last two numbers in the sequence, and carry on from the number you are left with. The system ends when all the numbers are crossed out, and you finish with more money than you started with. At the end of this particular sequence, you have finished with one more unit than you started with, which is pretty nice. However, just like all the other betting systems you can use, it isn't going to make you a profit at the end of it all. So why doesn't the Fibonacci system work? Well, lets put it another way; why would the Fibonacci system work? All you are doing with this is system is following a sequence of numbers to dictate how much you bet. The odds are not changing, and so the house maintains the same edge. It would be exactly like me making up a random sequence like 1, 4, 2, 6, 4, 1, 3, 3, 2 and telling you to follow that. Just because the Fibonacci sequence is a good model for the growth of rabbit populations, it doesn't mean it wields any magical powers over the roulette wheel. At the end of the day, this particular system is equally as good as betting on red every single time. It may look classy and educated, but there is nothing to it other than following a simple sequence of numbers and hoping to get lucky. It may be great fun to try out, but it isn't going to get you anywhere. In addition, I think I'd rather just place my bets and spin the wheel, rather than have to carry a pen and paper every time I play roulette. 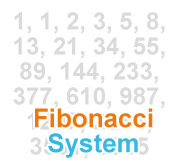 If you want to try out a system, I would go for the Fibonacci one over the Martingale system. This is purely because this system does not force you to make such large bets over a short period of time, and so you should experience far smaller swings. But at the end of it all, the house is still going to have the edge over you, so don't expect too much from them.